IT’S impossible to fathom what our world would look like without fashion. No — literally, it would be quite unimaginable; we wouldn’t even look like the Flintstones if Adam and Eve didn’t touch that Forbidden Fruit, but let’s not digress. Fashion has never been frivolous. Most importantly, it creates meaning, which is why we always gawk in awe at the hottest looks from the Instagram “runway”. Along this train of thought, if you feel like you’re stuck in a fashion rut, come take notes from the best-dressed men we’ve seen this month. If there is any way to juggle fashion influencing and humanitarian work, Jaden Smith has definitely struck the perfect balance. Making his rounds promoting his plastic-free water campaign, fans have spotted him with a striking pair of denim that reminds us of the Eclipse slim jeans from his collaboration with G-star Raw. There’s no better rhetoric than to look fashionable while doing good for Mother Nature; if he can make funky jeans a part of ordinary work wear, why can’t we? 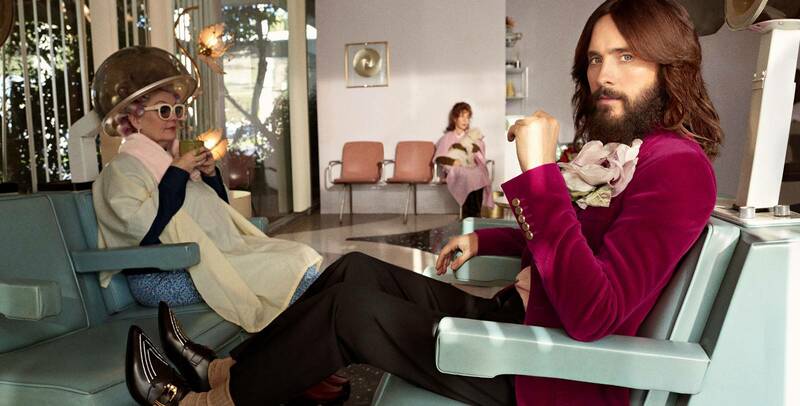 If God created fashion on the seventh day, then He appointed Jared Leto to be the Noah that saves men everywhere from a biblical fashion disaster. Aside from being Gucci’s muse, the way he dresses is beyond anyone’s ability to comprehend. We saw him gracing the latest covers of Numéro decked out in features from Gucci’s SS19 collection, namely the eccentric monochrome jackets and ostentatious necklace. If you still recall the 2018 Met Gala, Leto blew the Heavenly Bodies theme out of the water. We’re not saying he looks like a model, we’re saying he really looks like the fashion child of God. Not only is the boyband at the forefront of the current Hallyu wave, Wanna One member Yoon Ji Sung is also leading the “ulzzang” fashion hype. “Ulzzang” is a South Korean term that translates to “best face” or just good-looking, a fashion trend that utilises outfits and make-up to present the best appearance, especially with a casual and effortless quality. For the men, styles are usually a softer aesthetic: Oversized blazers and edgy headwear like the beret are some examples. To complete the whole look, you cannot forget the ubiquitous trait synonymous with the Koreans — flawless skin. Also from the K-pop scene, rapper Ravi is making appearances in a variety of looks in his comeback performances of late. Within his fashion repertoire are glitzy and suave tuxedos as well as rugged hypebeast ensembles. His stylist clearly deserves a raise; there is no stage presence more commanding than confidence in an outfit. Sometimes the biggest happenings during Paris Fashion Week aren’t on the runway, but with the influencers that are its attendees. One prime example is Pelayo Diaz a.k.a Prince Pelayo, photographed as he’s out and about in the city of love. From pairing trench coats with blazers to donning fedoras and peaked berets, if you want to be real “extra” when you go the extra mile for your dressing, he’s your man. His penchant for experimentation is often what we lack most in our styling ethos. After all, we dress to impress, so what’s a little danger in your everyday getup?